Anatomical knowledge has inspired and guided artists for centuries. From DaVinciâ€™s sublime studies to Michelangeloâ€™s muscular creations, the study of anatomy led to extraordinary achievements in the history of art. In this video Robert Liberace explores this tradition by examining the fundamental anatomical forms which shape the lights and shadows of the bodyâ€™s surface. 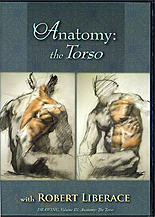 Working from a live model, each significant form-creating muscle of the torso is described and rendered from origin to insertion with a modified three-color chalk technique which highlights the muscle character, direction and the bony connections. The video also includes a chapter gallery which includes detailed reference diagrams drawn by Rob. Each diagram, based on the pose of the original drawing, features highlighted origins, insertions and actions of each individual muscle along with diagrams of the muscles themselves. Running time 2 hours, 48 minutes.